This disease has been observed in the southern part of Indiana. 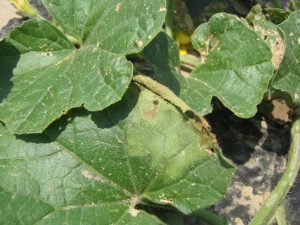 To identify bacterial wilt, look for the characteristic wilt and beetle feeding on the leaves and stem (Figure 1). The bacterium that causes this disease, Erwinia tracheiphila, is spread by the striped or spotted cucumber beetles. Once bacterial wilt is observed in the field, there is no treatment. To reduce the spread of bacterial wilt, treat for the striped or spotted cucumber beetles. Cucumbers are also susceptible to bacterial wilt. Pumpkins and squash are much less susceptible to bacterial wilt than cantaloupe or cucumbers. Watermelon are not susceptible to bacterial wilt. Figure 1. Characteristic marginal wilt caused by bacterial wilt. Note cucumber beetle feeding on leaf and on stem in back ground.